Every day I pack a bag for work as if I am going away for a week! I carry a big backpack filled with everything I need to keep me going for 8 hours. And it’s a lot! Especially food. Inspired by a couple of other sites, I thought I’d share. Ree @ Fort Negrita tells us about her zero-waste workday tools here. (I found this through Lois’s blog The Eco-Grandma but I can’t find the post). Rachel @ Rachel in Veganland does a show-and-tell about packing a bag for her 10-hour days here. I have a lot of containers that I use to bring food to work. I take plastic for anything I don’t need to heat, because it is lighter. But as my plastic containers wear out, I don’t replace them. Here’s a pic for a typical day. I get this stuff ready around 7:30 a.m.
You will see a 1-litre Thermos of coffee (half-caff), a mason jar of milk and a spill-proof travel mug. For lunch I will be having my favourite salad with some prepared salad dressing and a few Triscuit crackers. For snacks I have a giant orange, an apple and some yogurt with blueberries. I used to have a muffin or bagel every morning as well but I am on cutbacks! My food supply won’t fit into any standard lunch bag. I laugh at Bento boxes! I think a 24-can insulated cooler would do the trick. and I separate the foods that need to stay chilled. They will go into the staff room fridge at work. To my backpack I add my “purse stuff” so I don’t need to bring another bag: a day planner (yes, I still keep a paper one! 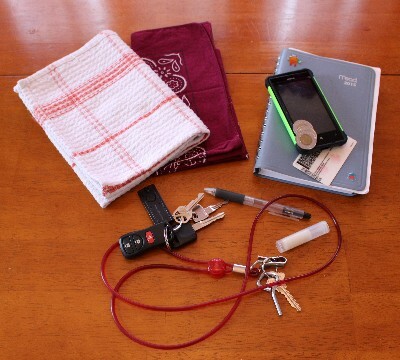 ), phone, ID, money, chapstick, pen, home keys, work keys, handkerchief, and a tea towel for doing my dishes! 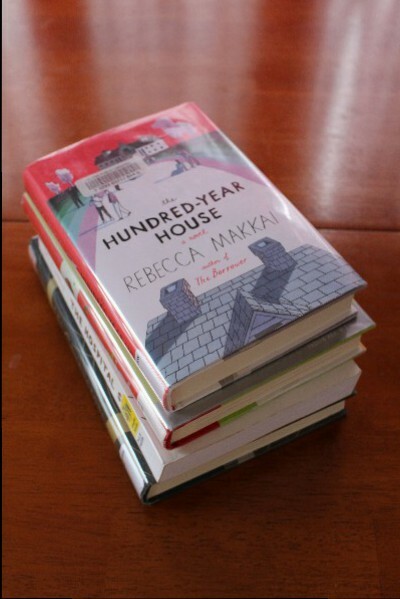 Then I look around for the library books that are due back. 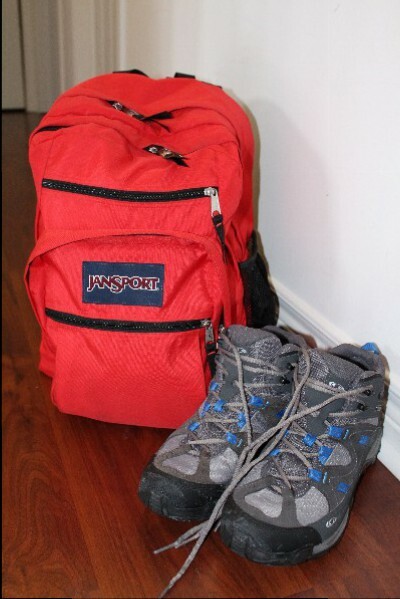 And here is my day pack, 18.5 lbs (8.5 kg) and ready for the hike to work. Happily, it comes back much lighter at the end of the day! Do you pack a lunch? If so, what do you bring? I pack dh a lunch everyday. He has a mini crockpot that he uses for soup. When it’s warmer he has salads and sandwiches. Me I have whatever I can be bothered to make!!! Rom packs his own lunch, LOL! I used to bring breakfast, lunch, and snack to work (and still do 1 day a week). Breakfast is yogurt, Kashi cereal, and a banana. Lunch used to be peanut butter and jam on whole grain bread, but now is same bread, an apple, a large baggie of cut up vegetables/cherry tomatoes/sour pickles, and a hard boiled egg. Snack is usually some pretzel sticks, and more fruit (grapes/clementines/cherries). I also drink copious amounts of coffee and water. I don’t mind the repetition, but I do vary the fruit and veggies depending upon season and what looks good when I shop. I started bringing lunch when I had to cut back to pay the mortgage, and then I got so used to it that it just became habit. Yum, you do good food! What do you carry it in? A wheelbarrow! I use a large zip lock bag to carry everything, and then smaller zip locks for the bread, and veggies or small fruits. Large fruits and the egg are loose in the bag. I wash and reuse everything until they are in tatters. I’ve tried some eco-alternatives, but this works the best for me. Ha ha! I use whatever plastic bags I need, too. I don’t travel light, that’s for sure! But I do use everything I bring to work. Less so when I travel – I always bring extra clothes – but no regrets, really! I would never travel with just a carry-on. I don’t leave any snacks at work; would eat them all on Day One! It’s understood that we put our lunch in the shared fridge but don’t bring several days worth and leave items there all week (not enough room). I used to hate carrying two phones and am glad I don’t have a work phone these days! Thanks for the shout out! 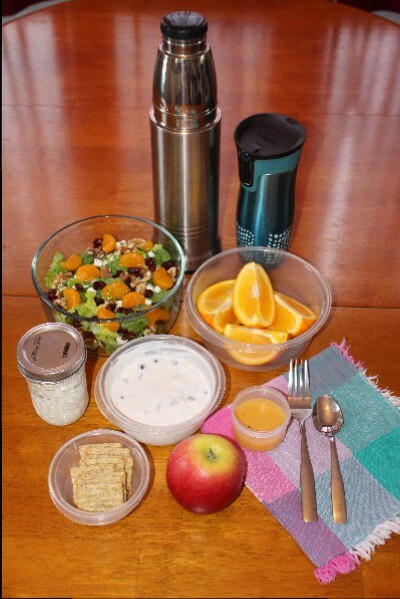 Your packed lunches look great! 🙂 I see that backpack you mentioned! I realized years ago that if I bring anything too tempting to work, I just get hungry for it. So, work is my fruit eating time. I usually bring three peices of fruit to work each day, and maybe a slice of wheat bread. I do have a weakness for a nice bento style lunch. If I am on a job where I figure that I will have time to sit down for a half-hour or so in a pleasant spot, and if there are some good left-overs in the fridge that compact well, I will make myself an attractive and varied bento. These are days that I trully look forward to, and sometimes look back at later. 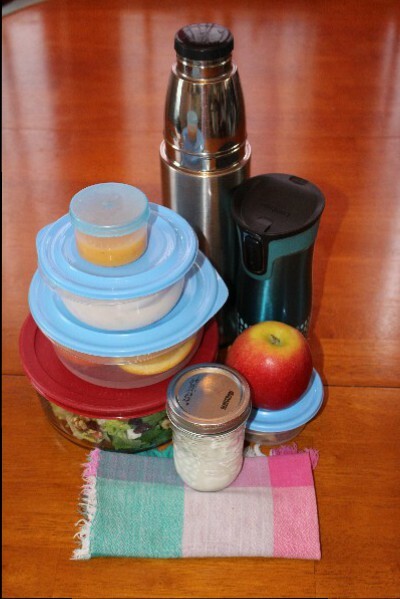 My method of carrying lunch changes each year, a small lunch bag works fine, but not if I am bringing a thermos of tea or coffee. I am the same – I now only take fruit and yogurt for snacks. I look forward to them, but not in the lascivious way I would snuffle down cookies and pretzels! This is something we are working on improving in our home. I like having lunch planned out even if I’m not leaving the house and Matt needs a lunch anyway. We keep getting thrown off though when he randomly gets free lunch at work which happens 2-3 times a week. Suddenly we have more food made than we need and things start going bad. We’re still trying to figure out how to fix this. Rom is the same; he often picks up free food at work. I should be so lucky! I walk home for lunch several days a week (unless I have a lot of meetings) but I have very little time – I mostly do it for the walk – so I decide/prepare what to have for lunch, just as if I were bringing it. That is so organised and waste-free! The coffee intrigues me – do you BYO because there’s only ‘instant’ at work? Apart from food, I have a pack with my work laptop and iPad that travel with me all day. I had to Google ‘French press’, believe it or not! I realised that in Australia they are universally referred to as a ‘coffee plunger.’ I can’t believe I’ve really never heard the term, ‘French press’ before! At the moment it is too difficult to make lunch – too many adults all needing the kitchen at once – it is a wonder I even manage breakfast! I love your extensive picnic – I should really follow your example. Ack, I would not do well with that, and lining up for showers, too! I am just hoping it doesn’t stretch out to October like the time they renovated their bathroom. I am wanting to get our house here decorated but we cannot move at the moment. Maybe I will find them a good B&B! What a great topic. I have recently been looking for a larger lunch bag (cooler) to take to work. I travel in my car from store to store and eat as I go. I just came across a unique idea (it is bento box style, but with larger compartments) that has room for thermos, cool packs, etc. I might try it out. Here is the link if you are interested http://planetbox.com/. I take water and some fruit, but only because my shifts are short. Any longer and I would be taking the full works to avoid buying anything. Lunch food selection is far too tempting. Luckily the food in my building is not tempting except for the fries! I love glass containers! So easy to clean 🙂 My lunches are similar except I like to pack leftovers. I prefer something warm rather than a sandwich or salad. I use a small cooler (meant for a six pack) to keep everything cool because the fridge at my work is unreliable. I also bring 3 reusable water bottles so I can make sure I drink enough water. I used to only bring one, but sometimes I would refill it when it was half full (to avoid leaving a meeting or something) and other times I’d fill it from empty. It was tricky to know at the end of the day if I’d had enough! So now I bring 3, which is a little extra weight, but at least I know for sure how much I had. We make meals with planned leftovers for future evenings, so we don’t dip into them for lunches. My go-to lunches right now are salads, avocado sandwiches, eggs, cheese toast or baked potatoes! Wow you eat so healthy! It’s a great idea, though, to pack a lunch–it’s definitely cheaper and more nutritious than what people end up with when they make no plan and end up eating fast food our out of a vending machine. Yep, we have both fast food and vending machines in my building so I don’t want to fall into those traps. Since New Year’s, I have been eating healthy. Hope I can make it last! 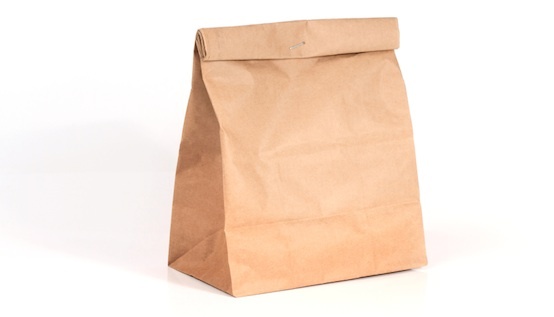 Your brown bag looks delicious! I wonder – do you feel like you get enough protein from your current offerings? (I can’t tell if that’s peanut butter with your apple or not!) I’m an avid brown bagger as well and find that I definitely need a protein in both my snack and my lunch to help make it through the work day 🙂 My snack is usually veggies & hummus (consumed around 10am) and lunch will either be leftovers from the previous night’s dinner (I do like a hot lunch!). Or, if I’m going old school, it will follow the peanut butter/banana sandwich, orange/apple, some type of cracker, etc. I’m down for a big hearty salad as well: spinach, carrots, cucumbers, mushrooms, kidney beans, hemp seeds, artichoke hearts, maybe almonds depending on what else is happening. I have warm lunches more often than not, and more salads in the summer. The salad I usually make has both goat cheese and walnuts, and I have yogurt every day (not vegan). I do watch my protein and make it up by the end of the day with a hearty dinner. The yogurt! Of course. Boy, a food i used to live on. Have you done the homemade yogurt route? Wow that’s quite a bag you carry but I am very impressed you can organize all that at 7:30 in the morning, I would have to prepare everything the night before as mornings and I just don’t get along. I don’t work outside the house so packing a bag isn’t a daily practice. Of course any time I do leave the house I have my reusable bag with all my necessities, including my stainless steel bottle of water, keys and such but mine would weigh just a few pounds if that. I am an early riser and a morning person. Would be too tired to get organized in the evenings before bed! I take lunch most days but also leave stuff at work. Goggle Happy Jackson set of containers for the cutest set. I would so buy them here in London but for the crappy exchange rate makes for too expensive plastic. Whoa, those are the cutest!